One winter day I listed to this song after a rough few days. I heard it and felt like I might, truly, collapse into a black hole. Soooo dramatic but it's true. It happens. We've all been there and will be there again. Those songs that just capture you and seem to pop out of thin air with your exact emotions and memories. My sister Kendra would always say "This song makes me feel weird" in a certain Kendra voice that meant it made her feel a little sad or a little understood or a little too grown up too fast....take your pick. I'm quite sure this song isn't about me and Jas. In fact I feel a little embarrassed to take it as ours since it's probably about war and the horrible state of the world. But as a good friend once said about a giant bag of Carmel corn..."I'm just gonna have some....k?". Back to the song.....the melodies...the chord progressions.....the words.....this year just balled up in a song. Every time I hear it I cry and cry and love Jason beyond any word in any language. Or maybe it's more that it makes me love us. I've always loved him but the duo we've become this year.....man...I don't even know how to finish that sentence. Anyway, music. Is there anything it can't do? Okay it can't cure cancer but I bet it's working on it. But none of that is ever gonna mean as much to me again. 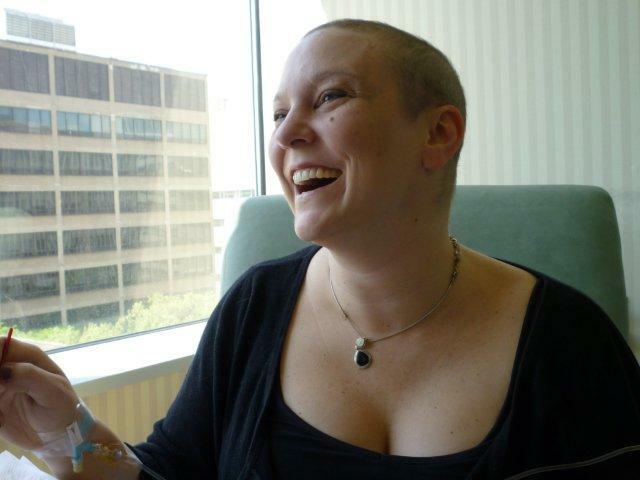 I've been joking that this picture (taken by my brother-in-law at my last treatment) should be the cover of Cancer Today Magazine. Not that there is one but there should be! Or Cancer Havers! or Cosmocancertin. Anywayyyyy I am feeling great. Great great great. That horrible fog in my head from the chemo has lifted and I feel vibrant again. Like my laugh sounds more like my own and my emotions feel more....feely. It rules. I can't even believe I'm to this point. I keep having these moments where everything lands on me all of a sudden and I feel like screaming and crying and break dancing and high kicking and eating with my mouth wide open right in someone's ear and punching walls and laughing like a lunatic all at once. I had my first Avastin treatment Tuesday and I was nervous. I mean I've been getting Avastin the whole time with the chemo but I got it in my head that it might make me feel sick again. It didn't! Not at all! It was easy like a Sunday morning. I will get "infused" with that drug every three weeks until January 11th or so. I start radiation on Tuesday. That is going to be a giant pain in the A but 6.5 weeks goes by really fast in the grand scheme of things. I will go every week day but it only takes about 30 minutes. I'm hoping not to have too many side effects (god...how those words have entered my vernacular sackular this year...side effects side effects side effects...terrible words). The best news of the day is that my hair is already starting to thicken up. I would say by August I will be able to comfortably go wig and scarf free. Fantastic fantastic. I have a little naggy fear that I imagine will never go away from all this. Side effect. Will it come back? Will someone I love get it? Will I take enough from it? and so forth. Seems normal to me so I'm not going to worry about it at this juncture. Wouldn't be prudent. That's right. I just did a G-Dub Senior/circa 89 Dana Carvey joke. I'm back, ladies and germs. After two of the hardest weeks ever post treatment I am finally feeling like myself again! 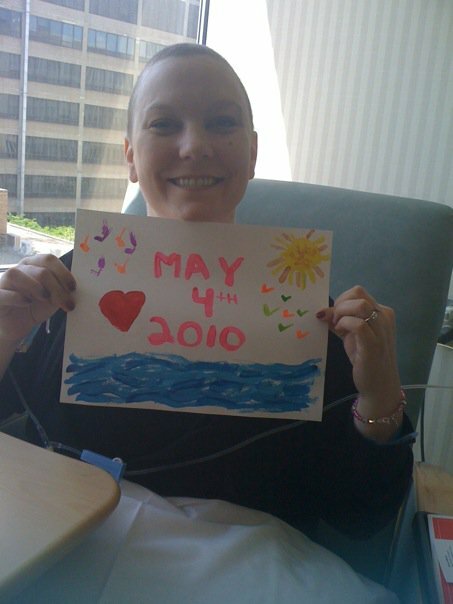 It just hit me today that I won't have to feel those chemo feelings again!!!!! No more everything tasting like salt. No more sours in my mouth or tooth aches. No more nausea. No more shots! No more knee aches and head aches. No more waking up sure that heaven is a'callin! Even though I know all of that it still hasn't all sunk in. All of this. I had a moment where I almost realized what just happnened but it started to make me feel a little shakey so I decided to wait a bit. I'll face it all down one of these days but for now I am just so happy that I am slowly but surely feeling whole again. I start radiation on June 1st every day for 6.5 weeks so once THAT is done I think I will really feel some more freedom. I can't wait! Guy Adkins - King of the Love Bubble. "Thank you for writing and sharing all of this with me. It's the greatest side effect of these notes that I write. I get to hear so many thoughts and stories from friends and from friends I don't know. It means so much to me right now. I don't know. It feels powerful, I guess." -Guy Adkins in reply to an email from me. Julie and I used to see every show Guy did in college when we were in high school. We ADORED him like an Elvis. He would walk onto the stage and just win the whole thing. There was a tenderness to him that endeared everyone who met him, as far as I can tell. I feel a little assuming or presumptuous or one of those types of words even writing about him since my contact with him was limited to a teen crush then adult respect via his writings. But this year I've had so many dreams about him and think about him and read his words over and over. He chose to be honest about his cancer and I've tried to be the same because of him. It's hard NOT to eulogize a person who inspires bravery and honesty. So there. I feel like he wouldn't mind. I hope not anyway. His notes on cancer terrified me and filled me with joy at the same time. Our cancer journeys were/are very different but he found ways to say so many of things that cross your mind when you are going through it. No matter what the cancer. No matter what the stage. I reached out to him via his blog/email to just let him know how inspiring he was to me when I was a teenager and now, as a 35 year old with cancer. Today I think of his heartbroken partner and his family and friends trying to understand all this. Ugh. Just the worst. But that love will live and live and live. Then I think of Jason and all I want to do is spring him from work, buy a bunch of canned goods and pasta and fire wood and just lean my bald head on his shoulder for 87 years and only take breaks to pee and cook noodles. Alas, life calls and you have to live it with as little fear as possible. You have to. He put into words so much of what I feel about this experience. He passed away last night into the storm. Full of light and love and music. Taken far too soon but finally free from the pain. He's everywhere now, I would imagine. Too many people loved him for his destination to be one finite place. Anyway....perspective. Love works. Thank you for being my friends and family. Hug and kiss each other today and tomorrow and every day for at least 87 years, please. Guy had a love bubble too. We are the lucky ones. "So I forgot my troubles and just got happy. Try it. I mean really try. I've said before that I don't want a fight and I still feel that here but I think we have to try. I still think this life we have is a gift and we have to try to be happy. I don't know if it's a right or a privilege, an accident or a figment of our imaginations. It's something everyone wants so much. It's everything, Happiness. And I really have it. At least it seems like I do. If I'm deluded, don't tell me. "-Guy's last post. I painted this pic. Don't be so jealous of my art skillz, you guys. My sister and brother-in-law came to sit with us for the last treatment. That was a really special gift. It has been hard to be so far away from home during all this. They brought some home here and that was simply lovely. So far I feel like total crap, but who cares! This is the last time!